Picosecond InfraRed Laser Mass Spectrometry (PIRL-MS) is a radically new technology that allows 10-second determination of tumour pathology (types or subtypes) faster than currently possible with conventional pathology and histology methods. PIRL-MS offers at least a 200-fold reduction in pathology determination time compared to current gold standard methods. 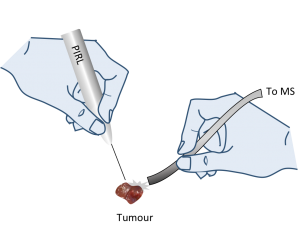 The short timeline to intrasurgical diagnosis offered by PIRL-MS’s radical acceleration of pathology determination time offers personalized cancer resection and treatment planning as soon as the tumour is encountered surgically. Therefore, appropriate interventional approaches such as a suitable degree of aggressiveness for tumour resection tailored to the prognostic information provided by PIRL-MS pathology in 10-second can be fully utilized in the operating room to improve outcomes, and to reduce resection-induced complications in low risk patients. Future clinical implementation of PIRL-MS pathology is expected to reduce patient wait time under anesthesia awaiting conventional pathology results, and may eliminate need for many revision surgeries to act on pathology feedback from specimens taken in the first surgery. Here, a full surgical intervention is expected to take place in the first and thus only surgery, saving health care costs. PIRL-MS uses a radically new observable of tumour molecular content signatures as opposed to morphologic contrast used in conventional pathology methods to characterize, and classify tumour types and subtypes. The pattern of laser extracted tumour molecules is so specific that can even distinguish between morphologically identical, yet molecularly distinct, subgroups of the same cancer type that cannot be told apart using basic staining and microscopy methods.